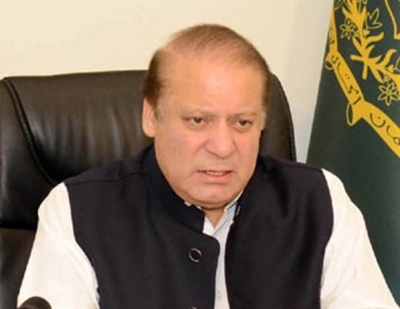 Beijing, May 14 (IANS) Pakistan Prime Minister Nawaz Sharif on Sunday said the China-Pakistan Economic Corridor (CPEC) was “open” to all the countries in the region and the “issue must not be politicised”. Sharif made the comments as India skipped China’s Belt and Road Summit in opposition to the planned economic route which passes through Pakistan-controlled Kashmir. “Let me make it very clear that CPEC is an economic undertaking open to all countries in the region. It has no geographical boundaries. It must not be politicized,” Sharif said here on the opening day of the event. India gave the forum a miss, opposing the $46 billion economic corridor which cuts through Pakistan-controlled Kashmir. New Delhi lays claim to the region. It is the key artery of China’s Belt and Road project, which connects Kashgar in Xinjiang with Gwadar port in Pakistan’s Balochistan. One Belt One Road (OBOR), Chinese President Xi Jinping’s dream project, envisages connecting Asia, Europe and Africa by a network of roads, railway tracks and shipping lanes. India sees the project, particularly CPEC, a geo-strategic project by China to limit its influence in South Asia. “We are not striving to merely leverage geography for economic prosperity; we are also trying to build a peaceful, connected and caring neighbourhood,” Sharif said. “OBOR belongs to all of us, those who are participating and those who are not as yet. “It is time we transcended our differences, resolve conflicts through dialogue and diplomacy and leave a legacy of peace for future generations,” he said at the event with 29 heads of states and governments and 1,500 delegates in attendance. “The OBOR signifies that geo-economics must take precedence over geopolitics and that the centre of gravity should shift from conflict to cooperation,” he said.